Posted May 13, 2006 in 2006/05, 6 Mainline, End of S & K, Foxhole, In Love, Serial Posts, z Archive. I am going to blog on the ending of the Simon and Kirby collaboration. I would like to go into it in more detail then I can comfortably cover in one post. So I will be dividing it up into a number of chapters. The May 29, 1947 issue of Saturday Review had an article by Dr. Frederick Wertham. Dr. Wertham had a very dim view of comic books and their influence on the young. I wonder how many comic book artists and publishers knew about the article or had any idea on how it would affect their livelihood? I suspect not many, I am sure it was far from thoughts of Joe Simon and Jack Kirby. They were too busy becoming comic book producers by launching crime titles for Prize and more importantly creating a whole new genre, romance comics. Those must have been exciting days for the two, and with the deals they made, Joe and Jack shared the profits from the success of their products. Although the future must have looked bright to our intrepid pair, Dr. Wertham’s efforts started to generate anti-comic sentiments in various communities. It did not all come at once, but built over the years until when his book “Seduction of the Innocent” was published in 1954. The pivotal date was April 22 and 23, 1954. That was when a Senate committee questioned Bill Gaines. Apparently Gaines appearance was not mandatory, other comic publishers declined to show up. But Bill went to defend the industry, unfortunately his appearance had a completely opposite effect. Gaines testimony was a disaster, public sentiment against comics rose to even greater heights. In a effort to circumvent possible legislation (and perhaps also to drive some competition out of the industry), some comic publishers got together to create the Comic Code Authority. The code was adopted on October 26, 1954. In theory use of the Comic Code was voluntary. But publishers knew that once the Comic Code stamp started appearing on covers, comics without it would not be accepted by many newsstands. So what were Simon and Kirby doing at the time of the Senate committee hearings? Well comic cover dates were usually two months after the distribution date. Typically it took one month to do the artwork, a month for the printer and a month for the distributor. However even in monthly titles, art may start on an issue before the art for the previous issue was completed. This means an adjustment of 5 or 6 months. So we could expect comics started at about the time of the Senate hearings would have cover dates of about October. Well for some time S&K were producing Black Magic, Young Romance, Young Love, and Young Brides for the publisher Prize Comics. The first issue of Fighting American, also for Prize, came out with an April date. But even more important Bullseye #1 came out with an August cover date. Joe and Jack started this issue before the Bill Gaine’s appearance before the Senate committee. But had they noticed the anti-comic sentiment spearheaded by Dr. Wertham? Bullseye #1 was more then the just the start of a new Simon and Kirby title, it was the start of Mainline Comics. Years back Joe and Jack had gone from being comic book artists to be being comic book producers. Now they were trying to make the transition to being comic book publishers. Bullseye was the first Mainline comic; Foxhole, In Love, and Police Trap would follow shortly. It was a big step but they would still be receiving income for the comics they produced for Prize. S&K probably tried to keep Prize unaware of their involvement in, let alone their ownership off, Mainline comics. Unlike their usual practice, early Mainline issues did not have any Simon and Kirby signature. 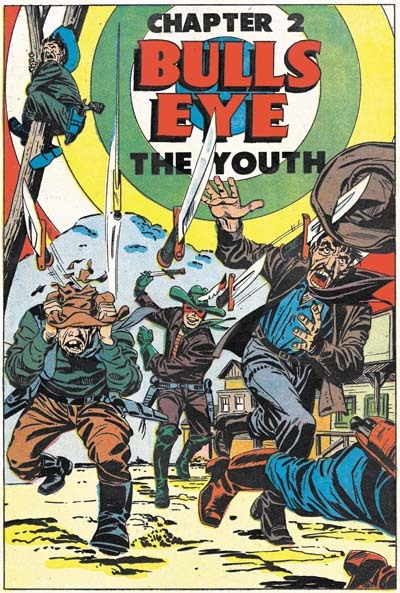 Only the fourth issues would carry a stamp indicating it was “another Simon and Kirby smash hit”. Starting up Mainline must have taken a lot of time and effort. Kirby’s efforts largely went to work on the Mainline comics only. S&K still produced comics for Prize, but Jack’s pencils would only appear in Black Magic and Fighting American, they would not appear in the romance titles. For the Prize romances they depended on their stable of freelance artists to fill the void left by the absent Jack. Simon and Kirby did not do many pure westerns, work of that type was limited to a few covers. Prior to Bullseye they had combined the western and kid gang genre to make Boys’ Ranch for Harvey. They even tried western and romance combo, although that turned out to be much more a romance then a western. 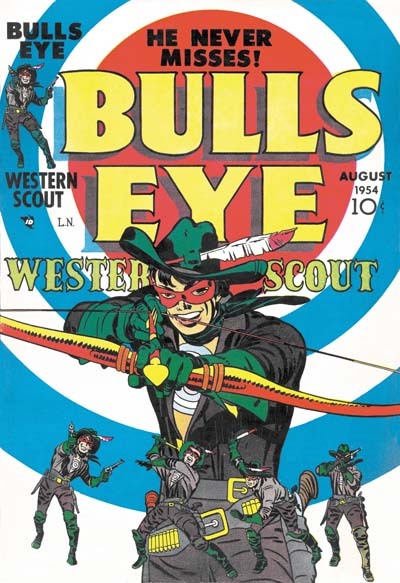 Now with Bullseye Joe and Jack mixed the western and hero genre. The idea was not unique, perhaps the most famous example would be the Lone Ranger. But you can count of S&K to make an exciting comic out of it. As a baby, Bullseye is saved by his grandfather from an Indian massacre that takes lives of his parents. As he grows, the hero apparently is a natural genius with rifles and pistols as he surprises his grandfather with his accuracy. An encounter with the Indian Yellow Snake leaves Bullseye with the loss of his grandfather and with a target branded on his chest. Bullseye takes to the road playing the part of a peddler, even his horse has a disguise! Of course there is lots of action in the stories, but often humor as well. It is a shame that this title has never been collected together as a reprint volume. As the originator of the romance comic genre, it comes as no surprise that Simon and Kirby would want to include a romance title in their Mainline comics line. But by 1954 there was an abundance of romance comics. So S&K decided that to make In Love unique it would include “novel length” story in each issue. The romances that Joe and Jack produced for Prize Comics often included stories of up to 13 pages long, longer then most of the competition. Now In Love would have stories up to 20 pages long and they would be divided into chapters. I have already described the story from In Love #1 “Bride Of The Star” in a post I did about The First Romance Comic. That story was penciled entirely by Jack. 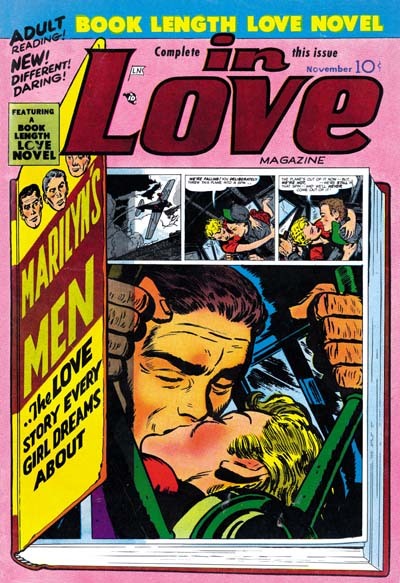 But Jack did only one chapter of “Marilyn’s Men” from In Love #2 the other two were done by Bill Draut. Jack returns to do the entire novelette for In Love #3 “Artist Loves Model”. That story is based on reworking of an unsuccessful syndication proposal. Issues from In Love #4 on do not have these extra-length stories. Whether that was because of S&K felt that the novelettes was not a successful idea, or because of other problems is not clear. 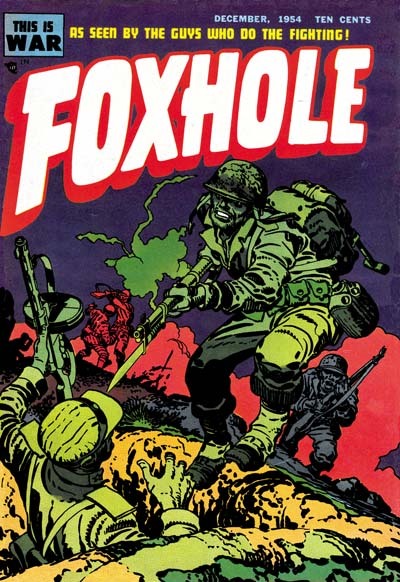 With Foxhole Simon and Kirby entered into the war genre. This was new for them as the closest they had done before was the Boy Commandos which was more a kid gang title then a war one. Here Joe and Jack would add their own twist to make the title unique. The stories in Foxhole were written and illustrated by war veterans. 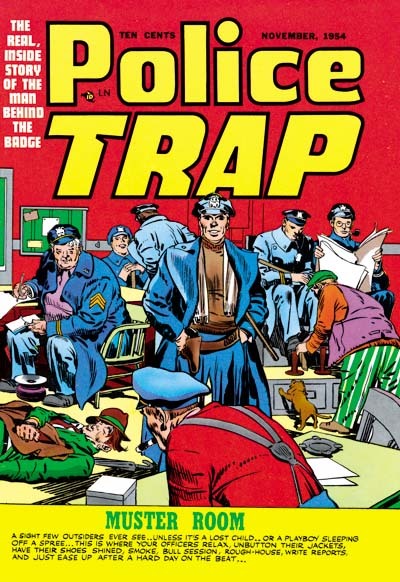 Mainline comics would also include a crime comic, titled Police Trap. The special angle to this title was that all the stories would be centered on the police, not the criminal. This may have been a response to all the adverse attention that crime comics had received recently, including ones that S&K had launched (Headline and Justice Traps the Guilty). But it certainly resulted in stories that portrayed the police in a better light and the criminal in a worse one. Mainline seemed to have a good lineup of titles. I would think that of all the Mainline titles, Bullseye would have the best chance to attract attention. It seems a perfect match for Kirby’s talents, allowing lots of action and humor. Although the western/hero combination may not have been unique, there does not seem to be much competition at that time. S&K have shown previously that they could do excellent crime stories. Here there was competition, but crime comics were receiving a lot of bad publicity. By centering the stories on the policemen, Police Trap could hope to escape some of this adverse attention. The other titles, In Love and Foxhole, were probably the weakest entries. Both had plenty of rival publications, in fact at this time there was an abundance of romance comics. Neither was sufficiently unique to be sure of attracting initial buyers. Still they were S&K productions and were done quite well. Given time they could develop a following.